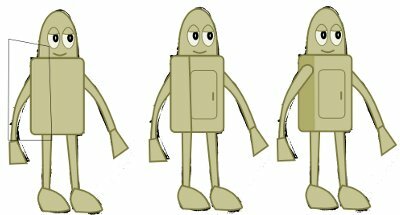 Inkscape: Inkscape will be used to create all of the robot character. This tutorial assumes you already have a basic knowledge of the program and are capable of selecting objects, changing fill and stroke colours, and editing nodes. This tutorial will take you through the steps you need to design and create a character which you can use in your game. This tutorial does not cover animating the character. If you would like to learn how to animate a character click here. 1 - Begin by drawing a simple sketch of your character. A sketch pad is the best place to start. The sketch does not have to be a work of art, but enough to show you the basic shape of your character. The key to creating a good character is often in simplicity. Try to draw the character in a few simple shapes. For this tutorial we will be creating a robot character, from this sketch below. 2 - Now that you have an idea of the look of the character, you can open up your graphics editing program. For this tutorial we will use Inkscape. Start by drawing some simple shapes that represent the main parts of the character’s body. You can import your sketch into Inkscape and use it as a reference. You can lower the opacity of the this reference image to make it easier to draw objects . It may also be useful to set the stroke/line colour to something easy to see. In this case, the stroke is orange. 3 - The next stage is to add a bit more detail to the character. This involves adding in the eyes, mouth and drawing the hatch on the front of the robot. 4 - We can now start to add a bit of colour to the image. Fill the shapes of the robot with a colour that is not too dark yet not too light. For the outline stroke of the character, a slightly darker version of the same colour can be used. 5 - To give the robot a bit of depth, a bit of shadow can be applied. The best way to create a shadow on a body part is to select the body part and duplicate it (CTRL+D). Then use the pen tool to draw the shape of the shadow. Select that new pen drawing and also the duplicate of the body part together by holding down shift. Do Path>Intersection to create your shadow shape. Lastly resize the shadow object, remove the stroke and colour it to a slightly darker shade than the main colour of the robot. 6 - You can also add highlights on the robot in same way as you added shadows. However, with the highlights they should be coloured slightly lighter. 7 - To complete the character you can remove the reference image, and export it for use in your game.